Famed diamond cutter Gabi Tolkowsky pays homage to his 273.85-carat Centenary Diamond with the Pink Sun Rise, a 29.78-carat diamond with a design similar to the Centenary's. 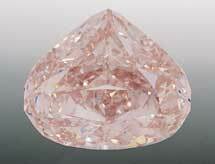 The diamond is a rare, flawless pink and was cut by Tolkowsky and his team of master craftsmen. Tolkowsky is also famed for cutting the largest diamond in the world, the Golden Jubilee Diamond.